CEC has a new Tiered Membership. I know you have heard me speak of the importance of belonging to CEC and CASE. I believe any administrator who is responsible for special education programs and therefore works with special education teachers should be a member of CEC so they can be provide the great resources of CEC for their teachers, stay informed on best practices in the field, and grow professionally. Of course, I think all administrators of special education programs should also be a member of CASE so they can have the information on leading those programs! CEC has made membership easier for all educators through the new tiered membership that went "live" on July 1! If you are not currently a member of CEC and CASE now is a great time to make the leap. I am a member at the Premier level which I think gives you the absolute most for your dues. In fact, at the Premier level, you get one division included free — or if it is CASE, you only have to pay an additional $25! But there are two other levels which provide varying amount of services that may be right for you. Click here for the chart that outlines the membership benefits and cost at each level. Then head on over to the CEC website. But don't forget to also add at least CASE as one of your divisions! Speaking of not forgetting... Don't forget it is still not too late to attend the 12th Annual CASE Educational Leadership Summit! This a great opportunity for you to reconnect and be revitalized with your colleagues from your state and with those from other states! We will begin on Sunday July 13 with registration at 4:00-4:55 and the session will begin at 5:00. We will be done by 7:00 p.m., just in time for you to grab some colleagues for a nice evening meal in Old Town, Alexandria! We need every state to have a team attending the 12th Annual CASE Educational Legislative Leadership Summit, July 13-16, 2014. On Wednesday morning, we will not only be debriefing but we will also be continuing our discussion on Reinventing Special Education and we need your voice on that topic too! Go to the CASE website to register and click here for the flyer. This year as every year, it is very important for CASE to have as many different states represented up on the Hill for our visit on Tuesday, July 15. There are several really important national issues we will be working on in DC this year with our other association partners. Don't miss this great opportunity. Click here to download a flyer. Don't forget to visit the CASE Career Center. If you haven't visited the CASE interactive job board at the CASE Career Center, now is a good time to do so! With its focus on special education administrators and professionals, the CASE Career Center offers members, and school districts, a highly targeted resource for online recruitment. Both members and non-members can use the CASE Career Center to reach qualified candidates. Employers can post jobs online, search for qualified candidates based on specific job criteria, and create an online resume agent to email qualified candidates daily. They also benefit from online reporting providing job activity statistics to track each job posting's return on investment. Federal education officials are dramatically altering the way they evaluate compliance with special education law and the change means far fewer states are living up to expectations. As Congress continues to check off items on their education "to-do" list, next up on the agenda: rewrite the Higher Education Act. Sure, this Congress has been called the "least productive in recent history" but there are some lawmakers who are intent on moving the education agenda, and have turned their attention to HEA. Recently, the U.S. Department of Education released information inviting applications for a new award to establish and operate a National Technical Assistance Center on Improving Transition to Postsecondary Education and Employment for Students with Disabilities. The Office of Special Education Programs is reopening Applications for New Awards for Training and Information for Parents of Children with Disabilities — Parent Training and Information Centers which was published in the Federal Register on Friday, June 27, 2014. On average, one or two kids in every U.S. classroom has dyslexia, a brain-based learning disability that often runs in families and makes reading difficult, sometimes painfully so. Now, new research shows it's possible to pick up some of the signs of dyslexia in the brain even before kids learn to read. And this earlier identification may start to substantially influence how parents, educators and clinicians tackle the disorder. In 2005, New Hampshire's Department of Education set a policy requiring schools to implement a competency-based system, but didn't define the specific skills each school would be expected to master. State education leaders hoped that the policy would push schools towards a system in which students would not advance unless they could demonstrate proficiency in every core competency. But schools across the state have interpreted the directive in very different ways and set those competencies both broadly and narrowly. Common Core assessments are making testing easier for students with special needs, experts say. The computer-based exams include tools such as on-screen calculators and read-aloud instructions to enhance accessibility for students with disabilities while keeping them in the classroom with their peers. "These accommodations are available with the click of a mouse — you don't have to worry about printing off a test with larger print or paper-based glossaries," says Magda Chia, director of support for underrepresented students at Smarter Balanced. "You can easily have a customized assessment for each student." Recently, the U.S Department of Education published a Notice in the Federal Register inviting applications for a new award to establish and operate a National Technical Assistance Center on Improving Transition to Postsecondary Education and Employment for Students with Disabilities. The Notice can be accessed at: http://www.gpo.gov/fdsys/pkg/FR-2014-07-02/pdf/2014-15437.pdf. The Center will assist State educational agencies, local educational agencies, State vocational rehabilitation agencies and other VR service providers to implement evidence-based and promising practices and strategies to ensure that students with disabilities, including those with significant disabilities, graduate from high school with the knowledge, skills, and supports needed for success in postsecondary education and employment. Trevor Alvord had no idea he was dyslexic until he graduated high school. "I just thought I was stupid," he said, adding that his mother had to read all of his homework and reading assignments to him in order for him to understand and succeed through the years of grade school and beyond. Now, his 9-year-old twin sons are inflicted with the same hereditary learning disorder, and he finds himself reading to them, as expensive tutoring is out of reach. Federal education officials are dramatically altering the way they evaluate compliance with special education law and the change means far fewer states are living up to expectations. For the first time, test scores and other outcome measures for students with disabilities are a central focus in state assessments conducted under the Individuals with Disabilities Education Act, the U.S. Department of Education said. Under the law, the Education Department determines each year how well states provide special education services and assigns one of four labels: "meets requirements," "needs assistance," "needs intervention" or "needs substantial intervention." The Obama administration said the vast majority of the 6.5 million students with disabilities in U.S. schools today are not receiving a quality education, and that it will hold states accountable for demonstrating that those students are making progress. Education Secretary Arne Duncan announced what he calls "a major shift" in how the government evaluates the effectiveness of federally funded special education programs. The complicated formulas that govern how federal special education money is parceled out to states have not been adjusted in over a decade, with the result that small districts get more federal money per student than large districts, and school systems that are losing students end up with more funding than school systems that are growing. These findings are part of a new policy brief released Friday from the Washington-based New America Foundation that tracks the evolution of Individuals with Disabilities Education Act funding. One out of every five children in the United States has dyslexia, a language-based learning disorder that can cause difficulties with spelling, writing, reading fluency, and word recognition. Early diagnosis can be extremely helpful, so here we're sharing a rundown of the early signs of dyslexia in children. Generally, symptoms of dyslexia include slow speech development, difficulty gauging directions, problems understanding sequences, poor reading ability, bad handwriting, poor organization abilities and poor memory about nonrelevant facts. More specifically, the following are common signs of dyslexia at various ages. A new survey paints a conflicting picture of parents' attitudes about the time students spend taking tests. The Friedman Foundation for Educational Choice's annual Schooling in America Survey shows 44 percent of parents think that schools devote too much time to testing. That same survey, however, found that the majority of parents — 52 percent, in fact — think their children either spend the right amount of time (30 percent) on testing or not enough (22 percent). 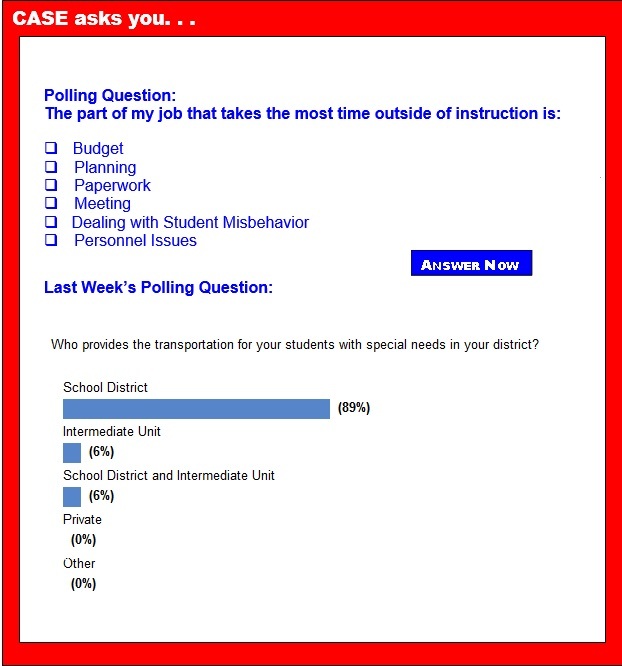 So depending on where you stand in the testing debate this survey could fuel that cause. Students who struggle early on with basic reading and math skills may continue to have a hard time as they progress through school. But many early grade teachers with students struggling in math appear to be more likely to use ineffective teaching methods, according to a new study. The study — funded by the Department of Education and the National Institutes of Health — found first-grade teachers with a higher percentage of students with math difficulties in their classrooms were more likely to use student-centered instructional methods (such as the use of calculators, or movement and music to learn math) that have not been associated with achievement gains. Can people with ADHD be more creative? Douglas Eby, a contributor for Psych Central, writes: "A number of psychologists note that many personality traits connected with ADD and ADHD are also associated with highly creative people. This is a topic I have addressed in previous Creative Mind posts, but here are some new perspectives, inspired by a documentary by Lisa Ling who was diagnosed with ADD during the course of her research for the project." Recently, the U.S Department of Education published a Notice in the Federal Register inviting applications for a new award to establish and operate a National Technical Assistance Center on Improving Transition to Postsecondary Education and Employment for Students with Disabilities. The Notice can be accessed at: http://www.gpo.gov/fdsys/pkg/FR-2014-07-02/pdf/2014-15437.pdf.